Currently the main transport link between Oxford and Witney is the A40, one of the most congested road links in the country. Every day thousands of cars use this road to get into Oxford. With the planned major housing expansion in Witney, Brize Norton, Carterton and Bampton the situation will get much worse. The area desperately needs an alternative transport system. The original railway line was opened from Yarnton to Witney in 1861 and then extended to Fairford in 1873. The whole line was closed west of Witney in 1962, during the Beeching era, but remained open for freight to Witney until 1970, when its mainstay, the blanket industry was already declining. In 2001 the Oxfordshire County Council carried out an in-depth study, commissioned to specialist Mott MacDonald, into the feasibility and possible costs for the reopening of the disused railway link. This study needs to be seen in the context that at the time the Council had planned major works on the A40 itself, as well as agreed on the construction of a guided busway (like the one recently built in Cambridge for example). The consultants concluded that having a guided bus route AND a railway link (especially a heavy rail one) would not have been feasible. In their report, however, the consultants suggested a number of other options, such as tram links and the projected ROI at the time was favourable. However, the report was shelved, no improvements were made to the A40 and no guided busway was ever built. Yet nearly 15 years later more cars are using this road and more housing developments are being planned alongside the A40 corridor. In 2009, the Association of Train Operating Companies (ATOC) identified Witney as a town which had grown substantially since the Beeching closure and justified re-opening the railway line. They indicated a possible Benefit to Cost Ratio of 1.8; re-openings elsewhere in the country have generated increases in passenger loadings orders of magnitude in excess of such predictions. The recent relocation of RAF personnel from Lyneham to Brize Norton has created additional traffic too, and, as the site expands, is likely to create even more. This traffic isn’t made up of the service personnel themselves engaged in active operational duties as they are ferried for the most part outside commuting hours, but hundreds of contractors are employed by the base and ancillary services, as well as admin staff unable to live in Brize Norton or Carterton. In addition two major housing developments have been proposed for Carterton, as well as more houses in neighbouring villages and a large developments within the perimeter of Witney (so large that a new A40 junction will need to be planned). The key question is a simple one: where would the additional traffic go without an alternative transport mode? The government has recently approved the development of a tram-train route between Sheffield and Rotherham, enabling trams to run through the streets of Sheffield and Rotherham but use Network Rail tracks between the two towns. 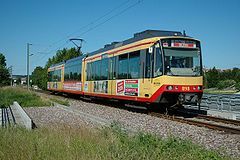 This is based on modern versions of such hybrid systems operated in Germany for several decades. With the upgrade of the Bicester to London railways, the possibility of reopening the Cowley branch and other rail projects around the District, the time may have come therefore for a new transport link from West Oxfordshire into Oxford and beyond.